Webkinz Members win their first communal contest! Webkinz users, after a disappointing loss last week, have won their first communal contest! Everyone was able to reach a total 5,000,000 (five million) Kinz Cash to win the contest! 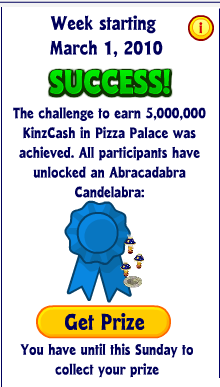 Each user who played Pizza Palace this past weekend was awarded a Abracadabra Candelabra. Don't forget to vote for the next communal contest's prize as you only have until Thursday to vote! Re: Webkinz Members win their first communal contest! I hope we get the prize we selected! I picked the sofa it's worth the most KC! Thanks to everyone for working together and lilkinzgradma for the great contest!! !